Cameras facing the inside of our cars? Yes, this is in the works. Once again, cars are getting more tech, but is it even useful? 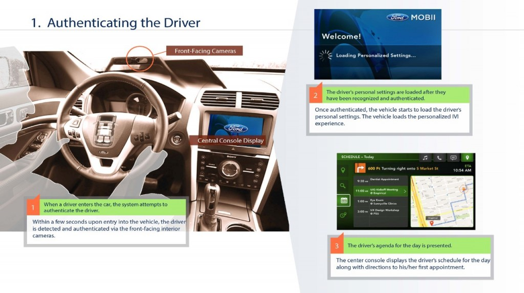 Ford and Intel believe this technology will help drivers and keep concerned parents calm. Ford and Intel are putting together a research project, Project Mobil, where they insert a camera into the dashboard for facial recognition. The owner of the vehicle is able to register family members’ faces to the car, and if the person who gets into the driver seat is not registered, the vehicle will not start. This is a good way to make sure your kids don’t take out your brand-new car without permission. Just like smart keys, this recognition software will adjust the car’s settings to whoever is driving. It can automatically adjust the music volume, driver’s seat position, vehicle speed, and so on. Drivers will also be able to adjust climate, sunroof, and other options by using voice commands, allowing the driver to pay more attention to the road. One option, which I find an invasion of personal space, is that the owner of the vehicle can “spy” on their kids or other drivers by receiving video feedback from the camera to their smart device or computer. I sure hope this feature is not available; if Project Mobil ever enters production, we will have no privacy. The automobile has always been a place to be alone, sing out loud or even talk to yourself. A Spying feature will end any alone time for sure. All around this seems like a great idea between Ford and Intel, together creating a safer and more convenient driving experience for families. As I’ve said in previous articles, the technology in our vehicles is getting more advanced and we are adapting to the world around us.